Mish's Global Economic Trend Analysis: Driverless Trains: Why Does Chicago (US in General) Lag London (Europe in General)? Driverless Trains: Why Does Chicago (US in General) Lag London (Europe in General)? Driverless trains are about to make a big impact in London. The Telegraph reports New 'Driverless' Tube trains unveiled by TFL. That article is from October 2014, recently sent to me by a reader. The trains are fully automated, but will initially be manned. By the mid-2020s the trains will be totally driverless. Link if video does not play: London's Driverless Tube Trains. The above video got me thinking about the sorry state of Chicago infrastructure and some spectacular "L" and subway crashes. Please consider A Rare Non-Tragic Chance to Revisit the Idea of Driverless Trains. It usually takes a tragedy of considerable proportions to reopen discussions of train safety in U.S. cities. But this time a mere video might do the trick. By now you may have caught footage of a Chicago blue line L train derailing and barreling up an escalator at the O'Hare station earlier this week, as if auditioning for a Bruce Willis movie. In the aftermath of the crash, much of the focus has been on the driver who evidently fell asleep at the helm (for the second time this year). Besides crashes, cities and riders pay through the nose for overtime. I did a quick check to see how much these drivers get paid. Back in 2010, the Chicago Tribune reported CTA Pay for Bus Drivers is No. 3 in Nation. Taking into account cost-of-living, Chicago bus drivers are the highest paid in the nation. 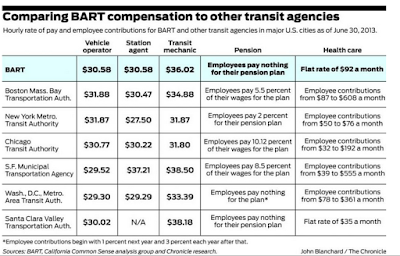 In 2013, the San Francisco Gate Compared BART Compensation to other cities. 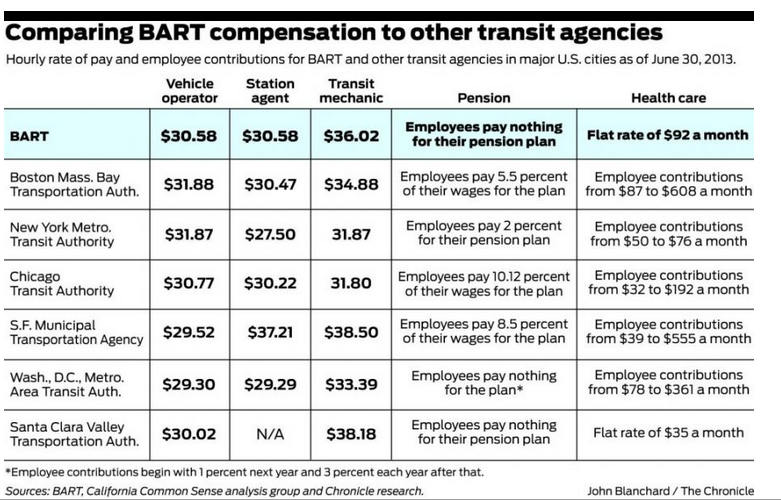 BART stands for Bay Area Regional Transportation. This is how the cities rank. In November of 2014, the Sun Times reported Metra's $100,000 Club Includes Conductors, Engineers. Nearly one in four Metra conductors and assistant conductors pulled down at least $100,000 last year, and an even higher proportion of engineers — almost 40 percent — took home that amount, a Chicago Sun-Times analysis shows. The six-figure salaries are based on a century-old formula — abandoned by some of Metra’s peers — that pays union conductors and engineers for hours worked and miles traveled over a certain allotment. The sooner Chicago and other US cites get on board with what obviously needs to be done, the better and safer taxpayers will be. Driverless trains, buses, trucks, and taxis are all coming. Millions of jobs will vanish, but we will all be better off. Unions will protest, but every one of these driver jobs should (and eventually will) go the way of the dinosaur.